Few would argue against the fact that BioWare's Neverwinter Nights helped revolutionize and evolve computer role-playing games. The title not only brought tabletop Dungeons & Dragons to the computer like no other game before it, but it also packed a toolset that allowed dungeon masters and players alike from all over the world to organize and adventure in an endless array of modules, both official and fan-created. Its achievements have not gone unnoticed either; the game has won over 85 awards at the time of this writing. 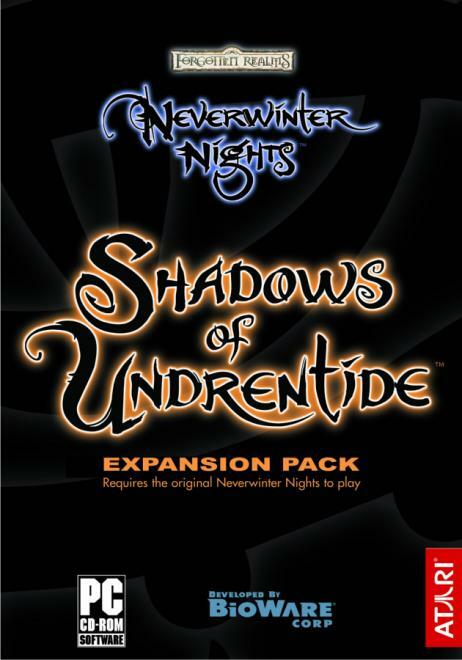 Now, almost a year since Neverwinter Nights was first released, BioWare and Floodgate Entertainment are gearing up to release the game's first expansion, Shadows of Undrentide. How will the expansion stand up to a game that is already this impressive? Well, due to our skillful (and relentless?) persuasion abilities, we were able to obtain a press copy of Shadows of Undrentide, which allows us to provide just enough information about the expansion to give you a good idea of what to expect. Shadows of Undrentide expands on the initial eleven classes by adding five new prestige classes: the Arcane Archer, Assassin, Blackguard, Harper Scout, and Shadowdancer. These classes cannot be chosen during initial character creation, however. Each of the new prestige classes has a list of requirements that must be met before you are able to choose it during the leveling process. For example, a character has to be of evil alignment and must first allocate eight points in both the Hide and Move Silently skills before the Assassin prestige class becomes available. These requirements are well worth the effort, however, as the prestige classes offer some very powerful abilities to a character. To give you an idea of the potency some of these abilities have to offer, let's take a closer look at the Arcane Archer's Hail of Arrows. This devastating ability will cause your bow to unleash an arrow at each and every hostile opponent in the vicinity. Find yourself being chased by a sizeable army of screaming Kobolds? No problem. In addition to the new prestige classes, Shadows of Undrentide will also add over fifty new spells to the game. Of course, with new spells come new spell effects, and Shadows of Undrentide has plenty of them. The Druid's new Bombardment spell brings a shower of fiery rocks down upon every opponent in the area, the Cleric's new Earthquake spell rattles the entire screen and throws your enemies to the ground, and the Wizard's new Isaac's Missile Storm spells fire a barrage of powerful missiles at virtually every enemy on the screen, depending on your character's level. The main spell-casting classes aren't the only ones who receive new spells, however; the Bard, Paladin, and Ranger all receive a smaller variety of the new arsenal. The expansion also gives players a chance to further customize their characters with the addition of thirty new feats. Many of these new feats give players the ability to enhance their character's defense or offense in some way or another. For example, the Arcane Defense feat provides a bonus to the character's saving throws versus a particular school of magic and the Rapid Reload feat allows your character to reload their crossbow so quickly that they get the same number of attacks as they would using a bow. If you're not interested in combat-oriented feats, there are also general feats like Thug, which gives your character a bonus to initiative and persuade checks.